Found this on the Art 21 blog. They only posted 10 of the 30. Enjoy the set. 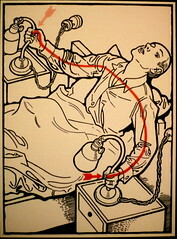 These are illustrations from Elektroschutz in 132 Bildern, published in 1930s. I find the style of the illustrations really striking.